If you received a US patent for a machine learning invention recently, count yourself among a record number of innovators named on artificial intelligence technology patents issued in 2017. There’s also good chance you worked for one of the top companies earning patents for machine learning, neural network, and other AI technologies, namely IBM, Amazon, Cisco, Google, and Microsoft, according to public patent records (available through mid-December). This year’s increase in the number of issued patents reflects similar record increases in the level of investment dollars flowing to AI start-ups and the number of AI tech sector M&A deals in 2017. 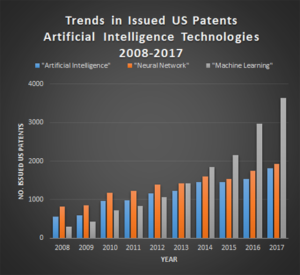 As the chart indicates, US patents directed to “machine learning” jumped over 20% in 2017 compared to 2016, and that follows an even larger estimated 38% annual increase between 2015 and 2016. Even discounting the patents that merely mention machine learning in passing, the numbers are still quite impressive, especially given the US Supreme Court’s 2014 Alice Corp. Pty Ltd. v. CLS Bank decision, which led to the invalidation of many software and business method patents and likely also put the brakes on software-related patent application filings (as explained here) beginning in 2014. So the recent jump in issued patents for “machine learning,” “artificial intelligence,” and “neural network” inventions suggests that specific applications of those technologies remain patentable despite Alice. 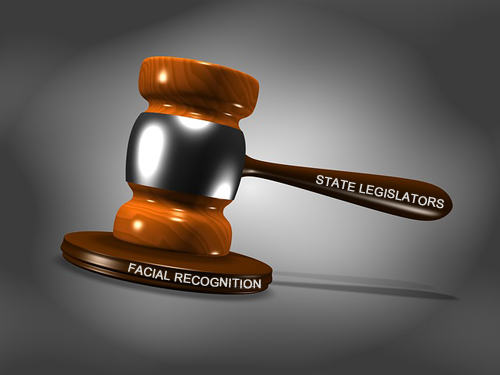 A jump in issued patents in a highly competitive, increasingly crowded market segment, could lead to an uptick in patent-related infringement. Already, estimates by some suggest that 35% more companies expect to face IP litigation in 2018 compared to 2017.